Hagworthingham (often referred to locally as Hag) is a village and civil parish in the East Lindsey district of Lincolnshire, England. 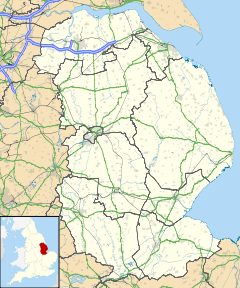 It is situated on the A158, 5 miles (8 km) east of Horncastle and 4 miles (6 km) north-west of Spilsby. The place-name 'Hagworthingham' is first attested in the Domesday Book of 1086, where it appears as Haberdingham and Hacberdingham. The name means 'village of the hawthorn homestead people'. Hagworthingham church, dedicated to the Holy Trinity, was restored by James Fowler of Louth in 1859. Thomas Drant, the clergyman and translator of Horace, was born in Hagworthingham. ^ "Parish population 2011". Retrieved 22 August 2015. ^ Eilert Ekwall, The Concise Oxford Dictionary of English Place-names, p.211. ^ Historic England. "Church of Holy Trinity (1063670)". National Heritage List for England. Retrieved 14 August 2011. This page was last edited on 8 November 2018, at 11:38 (UTC).